Zhao, G., Ji, S., Sun, T., Ma, F., and Chen, Z. (2017). "Production of bioflocculants prepared from wastewater supernatant of anaerobic co-digestion of corn straw and molasses wastewater treatment," BioRes. 12(1), 1991-2003. Novel bioflocculants (BS-MBF) were prepared using the wastewater supernatant from anaerobic co-digestion of corn straw and molasses wastewater as a nutrient resource. Acetic acid and ethanol were the dominant fermentation products during the anaerobic digestion process and were estimated to be 50.5% and 30.0%, respectively, after 150 d of operation. Equal volumes of bioflocculant producing bacteria F2 (Rhizobium radiobacter) and F6 (Bacillus sphaericus) were mixed to form F+, which was inoculated to wastewater supernatant at different times. A maximum flocculation activity of 91.3% was achieved, and 2.32 g/L of purified bioflocculant was extracted when a compound medium from 110-d wastewater supernatant was used. The removal efficiencies of heavy metals from simulated electroplating wastewater were tested by using these prepared bioflocculants. The optimal conditions for heavy metal removal to BS-MBF were found to be at 374 mg/L at an initial pH of 6.0 and a contact time of 40 min. The adsorption capacities for Cu2+ and Zn2+ reached more than 90%, while for Cr6+ it reached approximately 30%. Overall, the study showed for the first time that wastewater supernatant from anaerobic co-digestion of corn straw and molasses wastewater can be used for producing bioflocculants, which can be effectively used to remove heavy metals from electroplating wastewater. Anaerobic digestion (AD) technology has been widely applied to dispose of various kinds of organic waste products, such as agricultural solid wastes, livestock manure, and domestic waste, and has led to renewable energy production, nutrient recycling, and ecological environment protection (Zhang et al. 2014; Kamali et al. 2016). According to a Chinese renewable energy report, approximately 100,000 large-scale biogas-engineering projects were constructed in 2013 (Wu et al. 2015). However, a large amount of biogas slurry produced from these projects is not treated appropriately, which can cause secondary pollutions to soil and water (Bian et al. 2014; Wentzel et al. 2015). Currently, biogas slurry is used for fertilizer and seed leachate production because it contains abundant amounts of N, P, K, and micronutrients (Garg et al. 2005). However, many safety evaluations of ecological environments argue against biogas slurry fertilizers and irrigation techniques. Therefore, key technologies for harmless treatment and resource recycling of biogas slurry are urgently required. Bioflocculants are a type of biodegradable macromolecular flocculants that have attracted increasing technological attention in water and wastewater treatment because of their lack of secondary pollution and harmless effects on the environment (Salehizadeh and Shojaosadati 2002; Li et al. 2009). The major stumbling block for commercial development of bioflocculants is the high cost of substrates used for bioflocculant production (Yang et al. 2012; Guo et al. 2013). Although several studies have investigated the bioflocculant production using various low-cost substrates, such as agricultural biomass, wastewater, and industrial waste materials, there has been less investigation of bioflocculant production from wastewater supernatant during an AD process (Zhao et al. 2012). Biogas slurry digested from organic wastes contains various dissolved organic matter, such as acids, alcohols, inorganic salts, and micronutrients, which could be utilized by certain bioflocculant-producing microorganisms (Fujita et al. 2001; Wang et al. 2007; You et al. 2008). Bioflocculants are commonly applied to wastewater treatment, especially in heavy metal wastewater treatment, because they are safe to use in the environment. 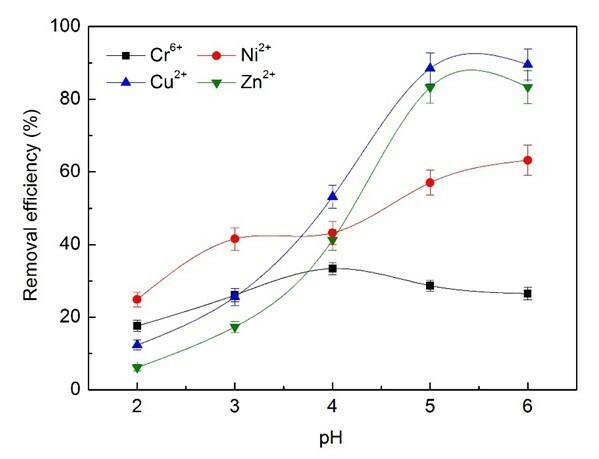 Electroplating wastewater containing complex heavy metals such as Cr6+, Zn2+, and Ni2+, which can damage human health and the ecological environment, is discharged during the electroplating process (Martín-Lara et al. 2014; Lu et al. 2015). Corn straw and molasses wastewater from the AD process for bioflocculant production has not been reported in previous studies. The present study focused on the production and optimization of bioflocculants by Rhizobium radiobacter and Bacillus sphaericus using wastewater supernatant from anaerobic co-digestion of corn straw and molasses wastewater as substrates. Furthermore, the produced bioflocculants were evaluated to determine their ability to treat heavy metal ions contained in electroplating wastewater. The corn straw was collected from Xiangfang farm in Heilongjiang, China. Molasses wastewater (CODCr = 78680 ± 232 mg/L, TN = 1528 ± 34 mg/L, pH 6.5 ± 0.1) was obtained from Shengda Yeast Food Co., Ltd in Heilongjiang, China. A continuous stirred tank reactor (CSTR) with a total volume of 20 L (24 cm diameter × 50 cm height) was used as a bioreactor, and the mixed fermentation liquor used was stirred 10 min/d with agitation at 100 rpm. Corn straws were cut into 0.5- to 1-cm sections, and the CSTR was operated continuously at an initial total solid concentration (TS) of 10 wt% for 210 d as a batch mode at 35 °C. The biogas slurry used for inoculum was taken from a large-scale biogas engineering plant utilizing cow manure at 35 °C in Hailin farm in Heilongjiang province. Bioflocculant-producing bacteria F2 (Rhizobium radiobacter) and F6 (Bacillus sphaericus) were screened from soils and offered by Heilongjiang Environmental Biotechnology Key Laboratory (China). Equal volumes of F2 and F6 were then mixed to form compound bioflocculant-producing bacteria (F+) used for bioflocculant production of wastewater supernatant. The seeding culture medium contained the following sterilized medium at pH 7.0: 10 g/L glucose, 0.5 g/L yeast extract, 0.5 g/L urea, 0.5 g/L K2HPO4, 5 g/L KH2PO4, 0.2 g/L MgSO4, and 0.1 g/L NaCl. The wastewater supernatant from anaerobic co-digestion of corn straw and molasses wastewater was collected from the CSTR at various fermentation periods and centrifuged at 12,000 g for 5 min. Then, glucose (2 g/L), KH2PO4 (2 g/L), and K2HPO4 (5 g/L) were mixed into a sterilized medium of wastewater supernatant as a compound culture medium following the procedure given in the authors’ previous study (Li et al. 2014). Simulated electroplating wastewater was prepared containing Cr6+ (48.5 mg/L), Zn2+ (36.8 mg/L), Cu2+ (59.5 mg/L), and Ni2+ (36.8 mg/L) using deionized water. The pH of the solution was adjusted using HCl and NaOH solutions. To analyze the flocculating activity with respect to heavy metal ion removal from electroplating wastewater, approximately 20 mL of wastewater was added to the bioflocculant at various dosage levels (0.5, 1, 1.5, 2, 2.5, 3, 3.5, 4, and 5 mL); pH (2, 3, 4, 5, 6, and 7); temperatures (10, 15, 20, 25, 30, 35, 40, and 45 °C); and time (5, 10, 15, 20, 25, 30, 40, 50, 60, 80, and 100 min). The bioflocculants were mixed in simulated electroplating wastewater operating at 25 °C with shaking at 140 at rpm, and a settling period of 15 min. The total solids (TS), volatile solids (VS), chemical oxygen demand (COD), total nitrogen (TN), total organic carbon (TOC), and pH were determined using standard methods (APHA 2005). The volatile fatty acid (VFA) and methane contents were measured using gas chromatography (Agilent technology, HP-6890, Wilmington, DE). Biogas yield was monitored on a daily basis by the water displacement method (Park and Li 2012). The reducing sugars were analyzed using the dinitrosalicylic acid (DNS) method (Miller 1959). The surface morphology of corn straw was observed with a scanning electron microscope (SEM, JSM-6390, JEOL, Tokyo, Japan). The heavy metal ions were determined by inductively coupled plasma atomic emission spectrometry (ICP-OES, Optima 5300DV, Perkin Elmer, USA). where A and B are the OD550 (optical density at 550 nm) of the control and sample, respectively. where and are the initial concentrations of heavy metal ions in simulated electroplating wastewater (g/L); is the total volume of the wastewater (L); and is the mass weight of bioflocculant (g) used for adsorption. The experiments were performed in a continuous stirred tank reactor (CSTR), which was fed with corn straw and molasses wastewater at 35 °C. The total volatile fatty acids (VFAs) values are important for AD operation, and those values were used here as the critical indicators of methanogenesis (Liew et al. 2011; Linke et al. 2015). 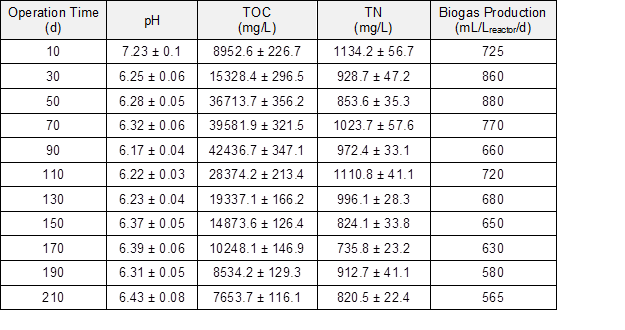 The VFAs and changes in biogas production yield, pH, total organic carbon (TOC), and total nitrogen (TN) contents are shown in Fig. 1 and Table 1. The pH decreased from 7.5 to 6.25 after 30 d of operation. 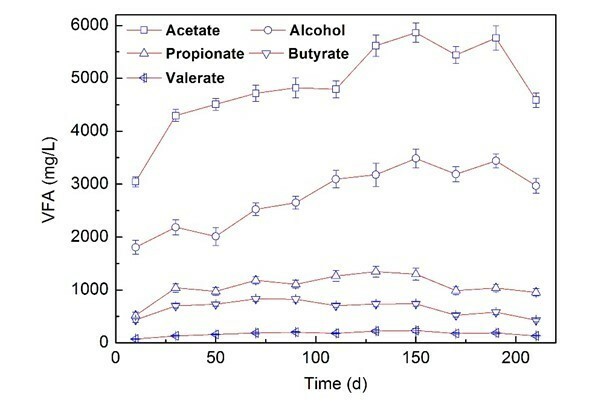 The fermentation products formed during the AD process were alcohol, acetate, propionate, butyrate, and valerate, which all initially exhibited an increasing trend and then started decreasing. All the VFAs showed a similar trend, and increased dramatically during the start-up period of 30 d.
The concentrations of ethanol and acetic acid dominated in the VFAs, which accounted for 30.01% and 50.48% after 150 d of operation, and the biogas production reached 725 mL/Lreactor/d after only 10 d of operation. We speculate that the molasses wastewater containing easily degradable organic matter, such as acetate, was beneficial to acidification, and the methanogenesis process sped up the degradation of corn straw, and caused an optimum biogas yield. The TOC concentration in the fermentation liquor decreased rapidly to 8953 mg/L after 10 d of operation and then increased to 42437 mg/L on the 90th day. The rapid decrease of TOC content was attributed to the adsorption by corn straw and the biogas-producing process. The degradation of corn straw contributed to the TOC content in fermentation liquor. The nitrogen (N) ratio during the anaerobic co-digestion of corn straw and molasses wastewater decreased from 1528 to 853.6 mg/L, which improved the anaerobic bacterial growth and metabolism. Meanwhile, the increase of the carbon-nitrogen (C/N) ratio reduced the risk of ammonia inhibition and was helpful in improving the methane potential during the AD process (Yen and Brune 2007; Procházka et al. 2012). A scanning electron microscope was used to observe the morphological structure of corn straw residue during various stages of the AD process. As shown in Fig. 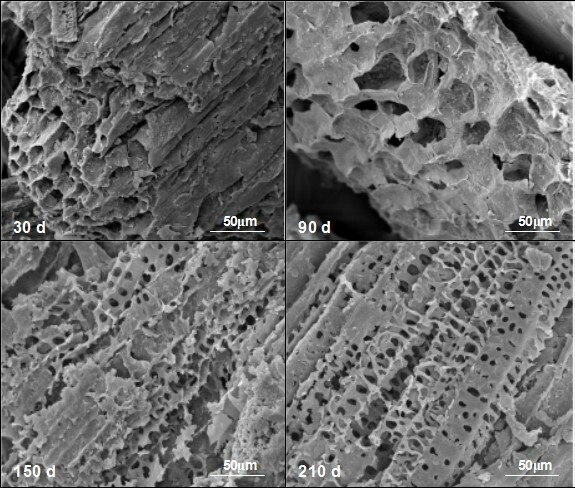 2, after 30 d of fermentation, the cell structure of corn straw, such as epidermis cells, parenchyma and vascular bundles, was still clearly observable. After 90 d of AD performance, the surface morphology of corn straw changed considerably, with the collapse of the regulated cell structure apparent. Then, after 150 d of fermentation, the vascular bundle exhibited fragility and many holes were detected in the surface. After 210 d of fermentation, the parenchyma cells were severely damaged, and a large ring of holes could be seen clearly. The wastewater supernatant from the co-digestion of corn straw and molasses wastewater was collected at different times (30th, 50th, 70th, 90th, 110th, 130th, and 150th days) for bioflocculant production. It is known that the composition of the medium plays a key role in biopolymer production and flocculating efficiency (Salehizadeh and Yan 2014). The compound medium from wastewater supernatant was sterilized and inoculated with F+ at a concentration of 8 wt%. The cultivating conditions were operated at an initial pH of 7.0, a temperature of 30 °C, with shaking at 140 rpm, and a fermentation period of 24 h.
As shown in Fig. 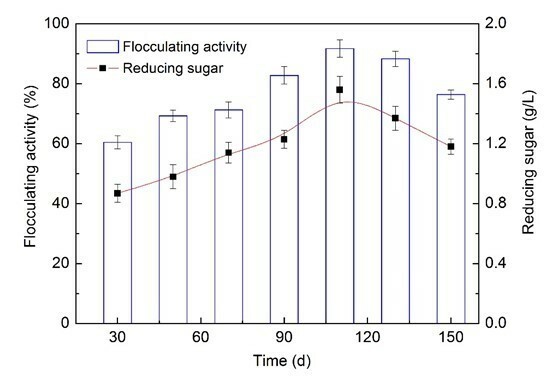 3, the variation of flocculating activity and the reducing sugar contents exhibited a similar trend of increase initial and then decrease. The bioflocculant activity was achieved at the 60.5% level using a 30-d fermentation liquor, and the activity was enhanced at the 8.8%, 10.7%, 22.4%, and 31.2% levels using 50-, 70-, 90- and 110-d fermentation liquors, respectively. Clearly, the maximum bioflocculant activity of 91.3% was obtained with reducing sugar content of 1.56 g/L when a 110-day wastewater supernatant was utilized, in comparison with other periods. It might be inferred that the wastewater supernatant from AD co-digestion of corn straw and molasses wastewater on day 110 were suitable for bioflocculant production, which might be due to its high concentrations of reducing sugar. Furthermore, the corn straw was rich in organic matter, VFAs, alcohol, and some dissolved organic matter from the hydrolysis-acidification process on day 110. Such substances also could be utilized easily by F+ and were beneficial to biopolymer production. Recently, many researchers have focused on developing cost-effective bioflocculant from wastes. Methanol wastewater has been used as a carbon source for bioflocculant production with optimum flocculant-producing activities of 93.1% (Cao et al. 2015). Dairy wastewater, when used as a medium for bioflocculant production, could achieve flocculant-producing activities of 95.4% (Wang et al. 2007). 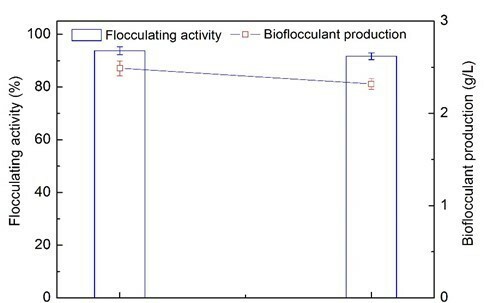 Figure 4 reveals the yield of bioflocculant obtained by extraction from the optimum biogas compound medium. The highest yield of 2.32 g/L was achieved using 110-day wastewater supernatant from the AD process, while 2.49 g/L was achieved from the traditional mediums (Wang et al. 2015). Therefore, it is feasible to use wastewater supernatant from the AD co-digestion of corn straw and molasses wastewater as a low-cost substrate to produce bioflocculants. A number of heavy metal ions, such as Cr6+, Zn2+, and Ni2+ are typically present in electroplating wastewater, which is one of the most harmful industrial wastewaters and is severely toxic to humans. To investigate the removal efficiency of these ions and the adsorption capacity of optimal dosage of bioflocculants, different dosages of bioflocculants were mixed in simulated electroplating wastewater operating at 25 °C with shaking at 140 rpm and an adsorption period of 50 min. As shown in Fig. 5, the Zn2+ and Cu2+ ions removal efficiency that could be achieved was more than 90%, while the maximum Cr6+ and Ni2+ ions removal efficiency was able to reach just 37% and 65%. 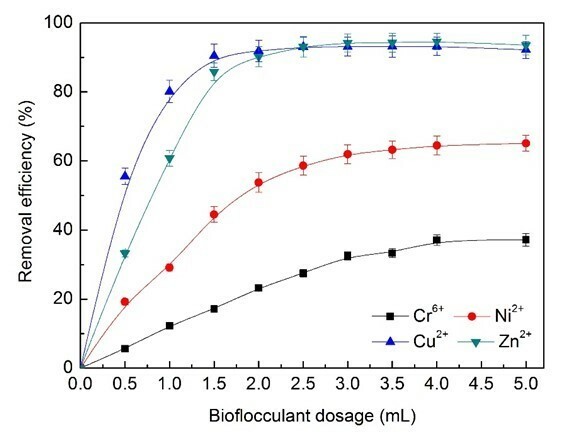 The adsorption capacity of Cu2+ ions decreased strongly from 96.8% to 76.45% when increasing the dosage of bioflocculants from 0.5 mL (62.25 mg/L BS-MBF) to 2.0 mL (249 mg/L BS-MBF) (Fig. 6). The removal efficiency and the cost of bioflocculants were comprehensively evaluated, and 3.0 mL (374 mg/L BS-MBF) was considered as the optimum dosage in the simulated electroplating wastewater treatment. The influence of pH on the removal efficiency of heavy metal ions was also studied, and 3 mL wastewater supernatant of bioflocculants was added and operated at 25 °C, with shaking at 140 rpm for 50 min. As shown in Fig. 7, the pH had a marked impact on the removal efficiency. The bioflocculants exhibited much less removal capacity for Cr6+ ions than the other metal ions, and the maximum removal efficiency of Cr6+ reached merely 33.4% at pH 4.0, after which it decreased with further increases in pH. The ionic species present will be affected by pH, even if the valence state remains the same. In the pH range 2.0 to 6.0, HCrO4− and Cr2O7− ions are in equilibrium. Chromium exhibited a state of HCrO4– at pH 4, and could be removed by electrostatic adsorption from the positive adsorption center of -NH4+ and -OH2+ of bioflocculants during acid conditions, which would be favorable to the adsorption process (Kumar et al. 2008). As the pH increases, the number of negatively charged sites increases and the number of positively charged sites decreases. Further, some enhancement of removal may be attributed to the fact that chromium (VI) is expected to oxidize some of the biopolymers or other organic matter present, and may get reduced to chromium (III) (Harry et al. 2008; Hubbe et al. 2011). The bioflocculants appeared to exhibit better adsorption capacity for chromium (III). 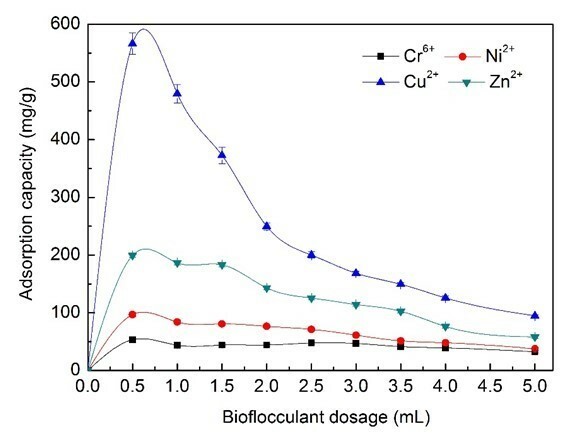 The optimum removal efficiencies of Zn2+ and Cu2+ by wastewater supernatant bioflocculants at pH 5.0 to 6.0 reached 89% and 83%, while the maximum removal efficiency of Ni2+ was 63.1% at pH 6.0. These results demonstrated that wastewater supernatant bioflocculants could have optimum removal efficiency for heavy metals of electroplating wastewater at pH 6.0. The influence of the contact time of heavy metals with electroplating wastewater on removal efficiency was determined at optimum dosages (374 mg/L BS-MBF) and pH (6.0), as illustrated in Fig. 8. There were three stages: fast adsorption, moderate adsorption, and dynamic equilibrium. The removal efficiency of Cr6+, Ni2+, Zn2+, and Cu2+ ions increased during the initial rapid-adsorption stage of 20 min, while the adsorption sites of bioflocculant were being gradually replaced, and reached 23.5%, 58.1%, 74.3%, and 86.7%, respectively. Then the removal efficiency continued to increase at a relatively slow speed with contact time of 40 min, until an equilibrium time was reached. 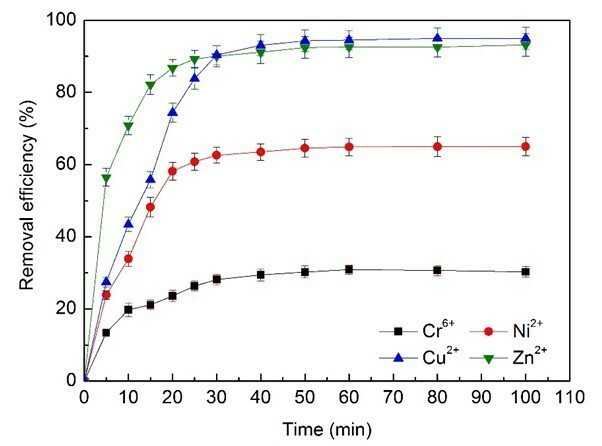 Obviously, the adsorption equilibrium time of Cr6+ was 40 min from the electroplating wastewater, and approximately 30 min for Ni2+, Zn2+, and Cu2+: thus 40 min was confirmed as the optimum contact time. It is feasible to use wastewater supernatant from anaerobic co-digestion of corn straw and molasses wastewater as a nutrient resource for producing bioflocculants. The maximum bioflocculant activity obtained was 91.3% with reducing sugar content of 1.56 g/L, and the highest yield of 2.32 g/L was achieved when 110-day wastewater supernatant was utilized from the AD process. The optimal conditions of heavy metal ions removal from electroplating wastewater for BS-MBF occurred at 374 mg/L, with an initial pH of 6.0, and a contact time of 40 min. The adsorption capacity of Cu2+ and Zn2+ reached more than 90%, while Cr6+ adsorption only reached approximately 30%. The authors are grateful for the financial support by the National Natural Science Foundation of China (No. 51541808), the Doctoral Scientific Research Foundation of Liaoning Province (No. 201501124), and the China Postdoctoral Science Foundation (No. 2014M561361). We also appreciate China Postdoctoral Science Foundation (No. 2014M561361), the Open Project of State Key Laboratory of Urban Water Resource and Environment, Harbin Institute of Technology (No. HCK201608). APHA (2005). Standard Methods for the Examination of Water and Wastewater, 21st Ed., American Public Health Association, Washington, DC. Fujita, M., Ike, M., Jang, J. H., Kim, S. M., and Hirao, T. (2001). “Bioflocculation production from lower-molecular fatty acids as a novel strategy for utilization of sludge digestion liquor,” Water Sci. Technol. 44(10), 237-243. Hubbe, M. A., Hasan, S. H., and Ducoste, J. J. (2011). “Cellulosic substrates for removal of pollutants from aqueous systems: A review. 1. Metals,” BioResources 6(2), 1-201. Kumar, R., Bishnoi, N. R., and Bishnoi, K. (2008). “Biosorption of chromium (VI) from aqueous solution and electroplating wastewater using fungal biomass,” Chem. Eng. J. 135(3), 202-208. DOI: 10.1016/j.cej.2007.03.004. Li, Z., Chen, R. W., Lei, H. Y., and Shan, Z., Bai, T., Yu, Q., and Li, H. L. (2009). “Characterization and flocculating properties of a novel bioflocculant produced by Bacillus circulans,” World J. Microb. Biot. 25(5), 745-752. Li, J., Ma, F, Zhao, G., Zhao Z., and Meng X., B. (2014). “Production of bioflocculants from biogas slurry and optimization of fermentation conditions,” China Water and Wastewater 30(15), 14-19. Martín-Lara, M. A., Blázquez, G., Trujillo, M. C., Pérez, A., and Calero, M. (2014). “New treatment of real electroplating wastewater containing heavy metal ions by adsorption onto olive stone,” J. Clean. Prod. 81(7), 120-129. DOI: 10.1016/j.jclepro.2014.06.036. anaerobic processes caused by insufficiency or excess of ammonia nitrogen,” Appl. Salehizadeh, H., and Shojaosadati, S. A. (2002). “Isolation and characterisation of a bioflocculant produced by Bacillus firmus,” Biotechnol. Lett. 24(1), 35-40. Article submitted: September 25, 2016; Peer review completed: December 4, 2016; Revised version received: December 21, 2016; Accepted: December 27, 2016; Published: January 31, 2017.